Although a cat resembling the Burmese was depicted in a book of poems published during the Ayudha period in Thailand between 1350 and 1767, the Burmese breed as we know it tody was developed in the United States (USA) in 1930, when a brown female cat of Oriental type, named Wong Mau (pictured right), was imported to the West Coast from Burma. As there were no similar cats for her to mate with, she was bred to a Siamese. All kittens born were therefore hybrids, but when some were mated back to their mother, brown kittens resembling the mother were produced. The progress of the Burmese in the USA was not smooth. Siamese breeders complained that Wong Mau was nothing more than a Siamese with poor colour. Indeed when a Burmese was exhibited at a show in San Francisco in 1938, Siamese breeders raised such a hue and cry that the cat was withdrawn from competition. The breed's prospects were further diminished when the Cat Fanciers Association (CFA) officially de-recognised Burmese in 1947 because most members of the breed could not meet the CFA's requirement that a purebred cat be descended from three generations of similar cats. 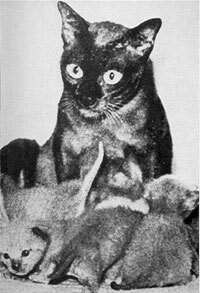 Despite the importation of three Burmese form Rangoon in 1941, breeders were still obliged to outcross to Seal point Siamese in order to keep from in-breeding their Burmese to extinction. Fortunately, other USA registries continued to recognise Burmese, thus ensuring the survival of the breed. By 1956 there were even enough three-generation Burmese available to merit reinstatement in the CFA register. The first Brown Burmese were imported into the United Kingdom in 1948 and this breed is now one of the most numerous on the show bench. Burmese cats were introduced to Australia in 1957 when a cat called Tomahawk was imported from the UK. (Read about the history of Burmese in Australia on the History page). Of the other colours, the Blue was the first to appear in the UK (1955) and was such an unexpected event that the first kitten was registered as "Sealcoat Blue Surprise". Since then, with intensive breeding programs, Lilac, Cream, Red, Chocolate and Tortoiseshell Burmese have been produced, all having the same temperament.